Merchants can use these terminals to process credit card and debit card sales and receive instant feedback regarding the status of the transaction — all through the credit card terminal. By accepting credit card payments, retail merchants are able to increase sales and reduce or eliminate bounced checks from customers. Your business and your customers deserve the best security and efficiency when orders are being processed; trust our credit card services to deliver on that. Charge.com offers all of the popular models of both dial-up and IP/Internet credit card terminals on the market and offers some lesser-known models, as well. If you are looking for a particular terminal model for ecommerce credit card processing and you don’t see it listed here, please contact us to inquire about availability. We’ll sort out your questions and concerns, and find you what you need. You won’t regret letting us give you the ability to accept credit cards online and offline. Hypercom is one of the world’s largest providers of electronic payment processing solutions. 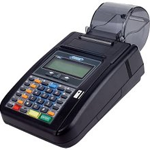 Charge.com offers a full line of Hypercom credit card terminals including popular models such as the Hypercom T7 Plus, and T4100. VeriFone is one of the largest manufacturers of credit card processing terminals with a variety of popular models including the VeriFone 3750. VeriFone offers a large selection of credit card processing products to fit every merchant’s needs. Offering one of the most popular terminals in the world, the Nurit 2085, Nurit is a well-known, highly respected company that offers reliable and technologically advanced credit card processing terminals which make the task of collecting payments virtually effortless. With over 15 million terminals deployed across 125 countries, Ingenico has the largest worldwide market share in the electronic payments industry. The Ingenico Aqua 50 is one of the best-selling terminals due to its robust features, integrated PIN pad, and low cost.